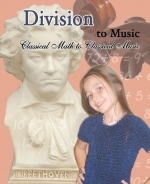 Now we are proud to offer your children, Classical Math to Classical Music-Division. Experience classical math education and classical music education–-all in one program! Every well-educated child should know something about the greatest music ever written–-Classical Music. They should know about the people who wrote that music. They’ve probably heard names like Bach, Beethoven and Mozart. But there are many other classical composers whose music they’ve heard but whose names they do not recognize–-names like Grieg, Purcell, Offenbach, Saint-Saens, Ponchielli, and Sullivan. They’ve heard their music at the movies and on TV but may not associate the tunes with great classical music. These songs put the division facts to music–-not just any music– but the timeless melodies of the great classical composers. While almost everyone memorizes the multiplication tables, very few children take the time to memorize their division facts. It’s really great to have such facts as “72 divided by 8” on the tip of your tongue. With this program, you’ll hear these facts to a rousing march by John Phillip Sousa, to Wagner’s famous wedding march, or to other famous classical works. You’ll gain a new appreciation for great classical music. Grieg’s "In the Hall of the Mountain King" from the "Peer Gynt Suite"
Brahms’ "Hungarian Dance #5 in F#"
Tchaikovsky’s "Waltz of the Flowers" from "The Nutcracker" "
Ponchielli’s "Dance of the Hours"
Saint-Saens’ "Carnival of the Animals"
Wagner’s "Bridal Chorus" from "Lohengrin"